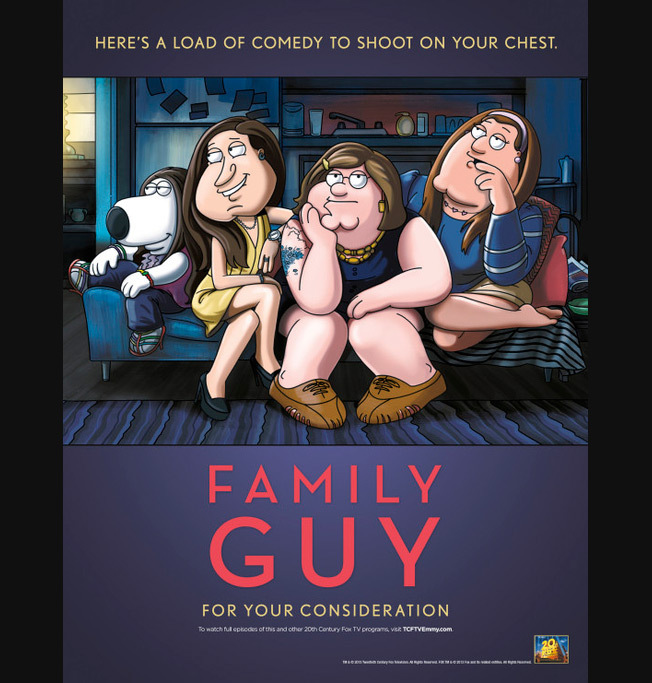 Fox's Family Guy has a new "For Your Consideration" ad for this year's Emmy Awards, because Seth MacFarlane's unfunny Rat Pack schtick hasn't ruined enough award shows yet. The latest ad references an episode of HBO's Girls in which someone received a pearl necklace. Hence the Family Guy headline: "Here's a load of comedy to shoot on your chest." Groan. It's better than the lazy Jew-baiting that MacFarlane and company have been relying on lately, but that Girls episode was beaten to death long before they got to it. But that's to be expected from a show that hasn't been funny since I was in college.